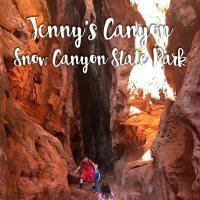 Franklin Falls is a well loved trail, and now I know why. 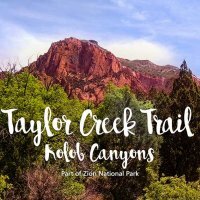 This is a must-do hike. 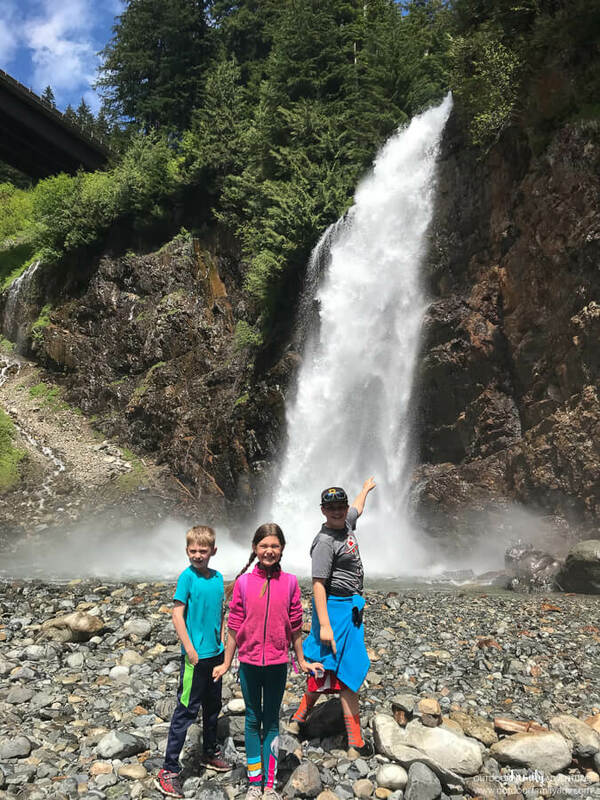 Found inside Snoqualmie Pass, next to the Denny Creek Campground, you’ll be amazed at how quick of an adventure it is to the stunning Franklin Falls. There’s ample parking, but it does fill up fast. On weekends and nice days you may want to plan an early visit… or more patience. This trail can get very, very busy. PASS REQUIRED!! 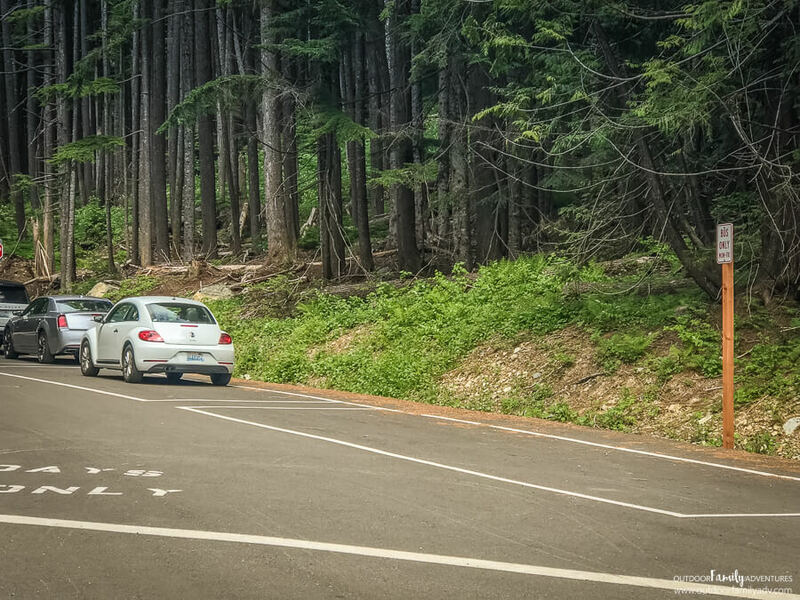 A Northwest Forest Pass is required to park/hike here. It is $30 annually, or $5 for the day. You can purchase your day pass several days in advance and write down the day you will be using them. 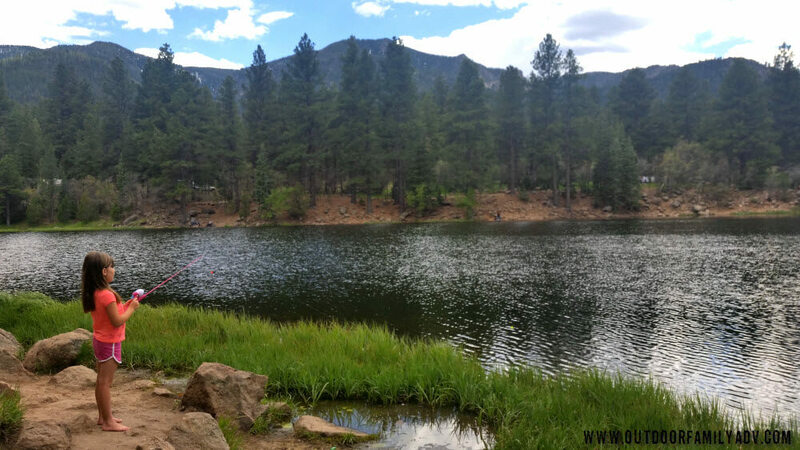 The pass is purchased at National Forest Offices and visitor centers. Or do the easiest thing possible–save yourself some time and buy it online here. Note that the National Forest Offices (where you pay the daily $5 in person) is no where near the trailhead. Please make sure you have taken care of your pass PRIOR to parking at the trailhead. There is handicap parking closer to the trailhead than the lot in the picture below. Make sure you have your parking permits. If you are visiting Saturday or Sunday, there is extra parking in the bus only lanes. Note that you cannot park in the bus lane Monday-Friday. Once you park it’s a quick walk from pavement to trailhead. The paths are clearly marked and easy to find. 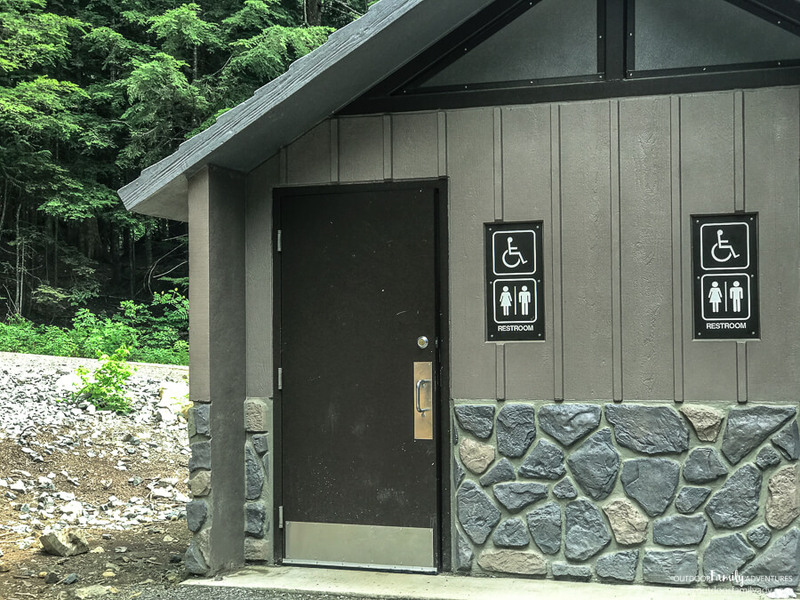 Before you get going on the main trail, stop and use the vault toilets as needed (my kids call them the “pit o’ poop”). 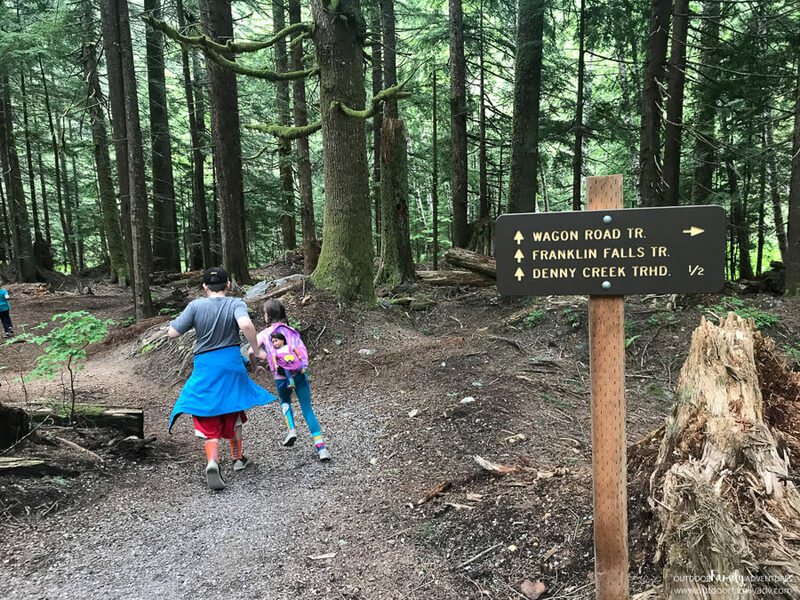 There was almost no toilet paper when we arrived (and other hikers mentioned this on the WTA site as well) so it may not be a bad idea to pack some TP just in case. Especially if you have little ones. Like I said… this is a very busy trail. Now, get your camera ready and have some fun! This hike is easy. With that said — there are a lot of stairs and climbing in elevation (gain about 400 feet, highest elevation point is 2600 feet). It’s only 1.25 miles to the falls, but if you aren’t in great shape or have bad knees, take your time. You can do it! 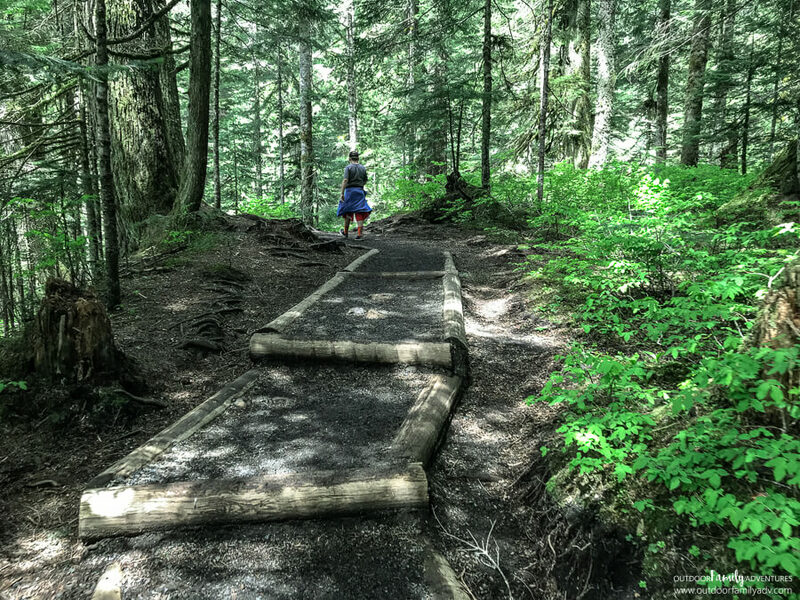 So many little kids hiked this trail and they can do it on their own. The trail is compact dirt, gravel and very well kept. Plenty of amazing views. 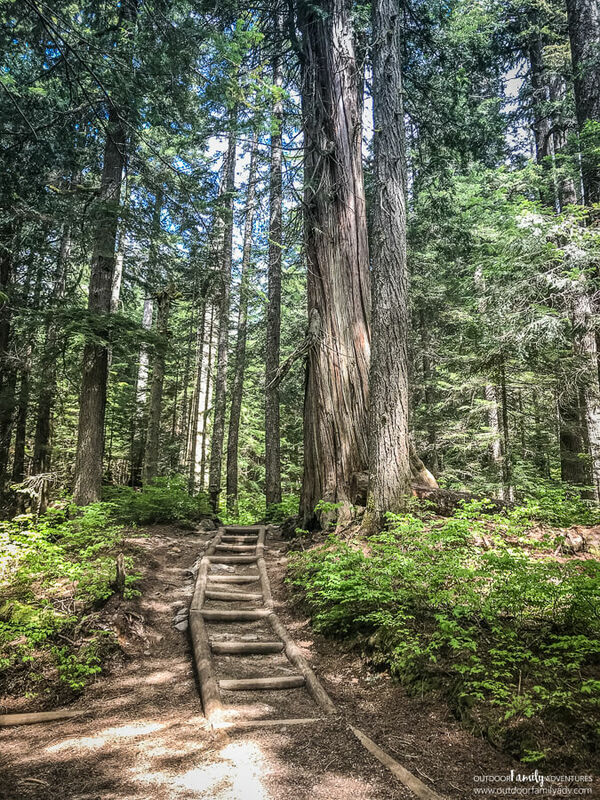 This hike can be done quickly, but take your time to enjoy the sounds, smells and sights. The water is gorgeous, especially in spring time after the snow run off. One thing I like about this trail is that it is very easy to follow. 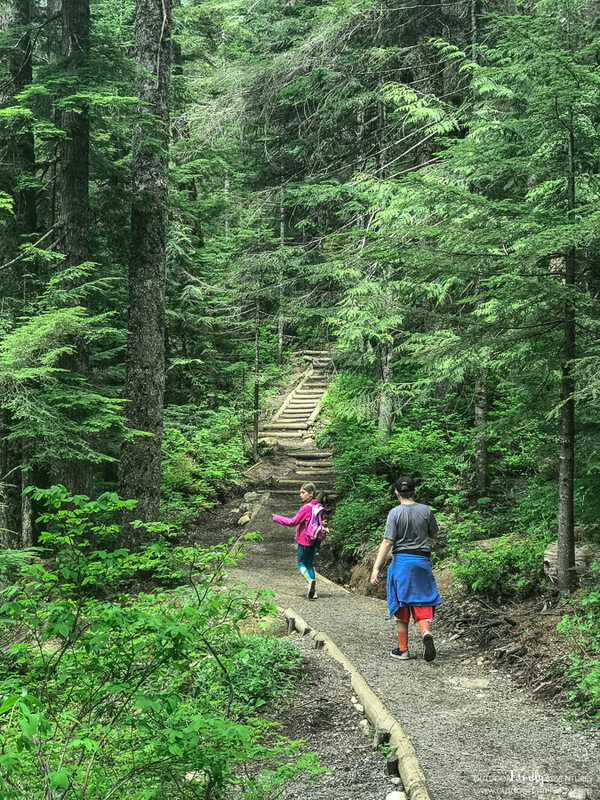 I love trails that allow my kids to forge ahead of me. 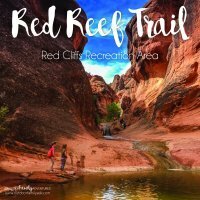 This is a great trail to allow some freedom (there are some unprotected edges on hillsides in case you have very little kids). 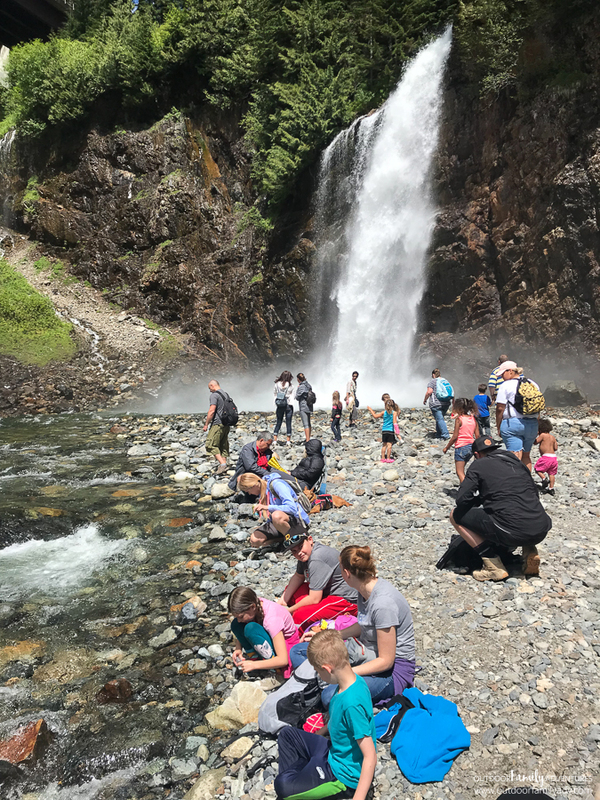 From one parent to another: Please teach your kids hiking etiquette. Some basic manners were lost on our adventure, but nothing too crazy. 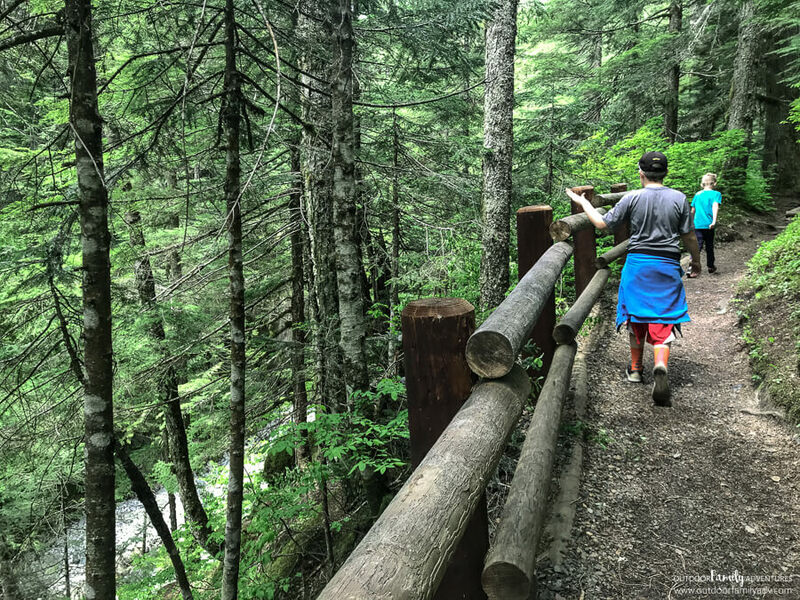 General courtesy is usually best practice; once a trail becomes incredibly busy, it’s very important for your brood to know the basics of hiking etiquette. It’s all breathtaking. I could have spent hours taking pictures. 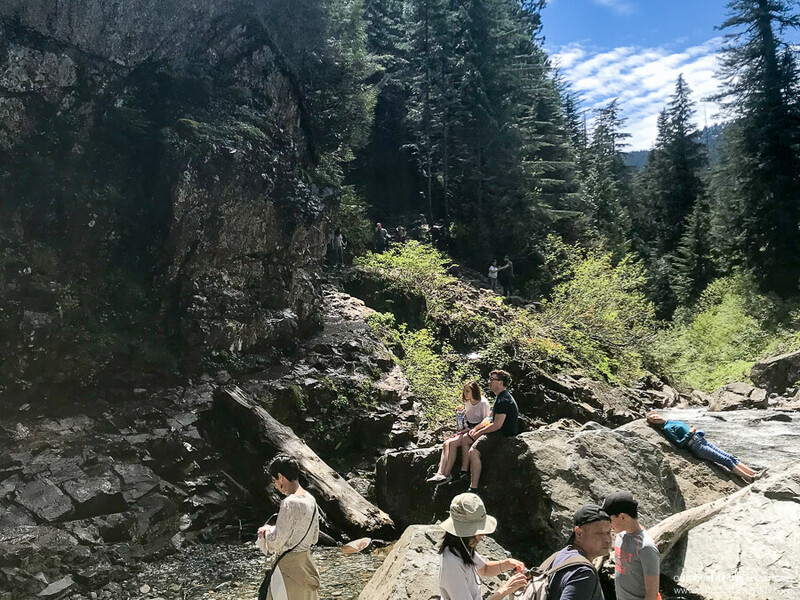 The trickiest part of the hike was walking down to the river’s edge and falls because the rock is always wet and slippery. 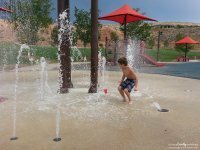 With some help for little ones, it is easy to navigate down the rocks to the base of the waterfall. The final walk of the trail is seen below; just above the large log and woman in white. Depending on the time of year, the mist will get you pretty wet! Plan on spending some time down at the falls and letting the kids play in the mist and wade in the cold water. I can’t speak highly enough of this trail. When we hiked, it was just after Memorial Day. We parked in the last open stall of the parking lot. Although busy, I did not feel crowded. I hear this changes during the summer months. Once you’re there — enjoy!! 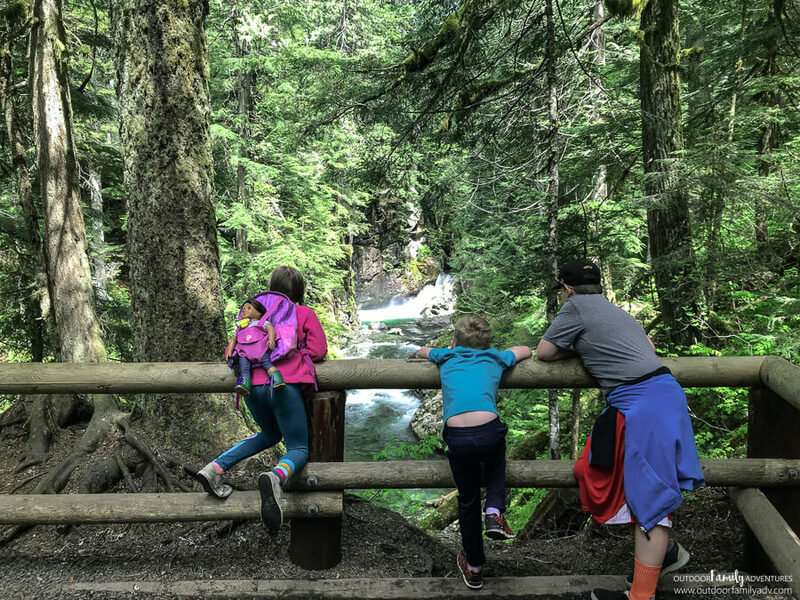 My kids loved this hike more than I had anticipated. Getting up close and personal to such a magnificent waterfall isn’t an every day experience. (NOTE: Google Maps destination of “Franklin Falls” may take you on a different route than the one listed below. Do not take it. The instructions below are accurate and quicker than google maps i.e. it wanted me to take exit 52 and back track). The trailhead can be accessed via a trail that begins near the bulletin board in the parking lot. 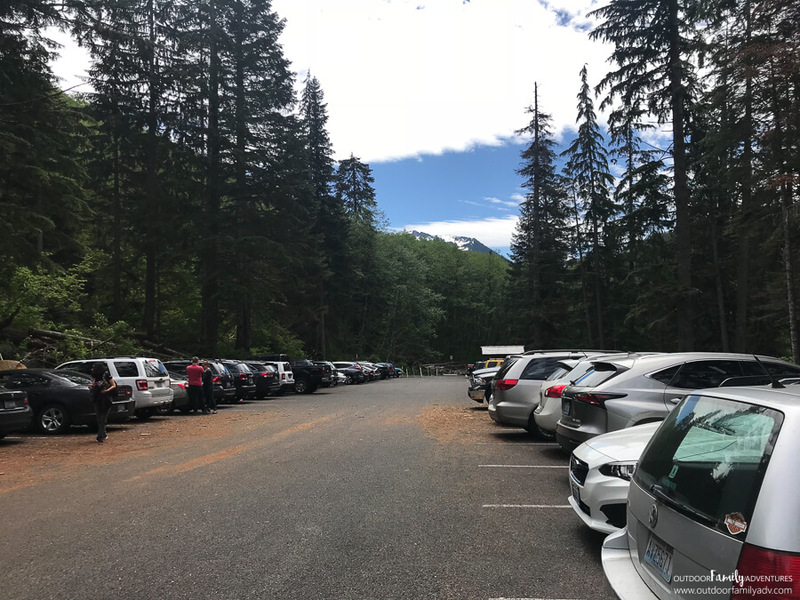 There is ADA parking available nearer the Franklin Falls Trailhead. Be sure to have a placard; parking patrols are on and will ticket violaters. For up to date trail conditions click here.